All Occasion Limousines are the proud winners of 2018 Limousine Company Of The Year award. Dodge Nitro stretch limousines exclusive to Adelaide by All Occasion Limo Hire. Definitely a step up from the Hummer Limo, spacious, floor and ceiling lighting effects, 5.1 stereo and video, (you control it), strobe and laser lighting and luxury seating. Your School Formal Car Hire, wedding Transport demands the Limousine a step above the rest. Our Wedding Car Hire Adelaide and All Suburbs is a premium service and is stretch limo hire at its best with dapper chauffeurs and beautifully appointed stretch limos. Get real style with Limo Hire in Adelaide from All Occasion Limousines. Traveling in these beautiful vehicles is a journey to remember. Your wedding is a day where you want everything to run smoothly. From the ceremony to the reception, you want ever detail to be perfect. One extremely important factor you must consider when planning your wedding is how you’re going to get there. Finding the right Wedding Car Hire in Adelaide is crucial to ensure your big day runs like clockwork. This is where we come in. Every wedding party, every bride and groom have special needs, so we offer what YOU really need. 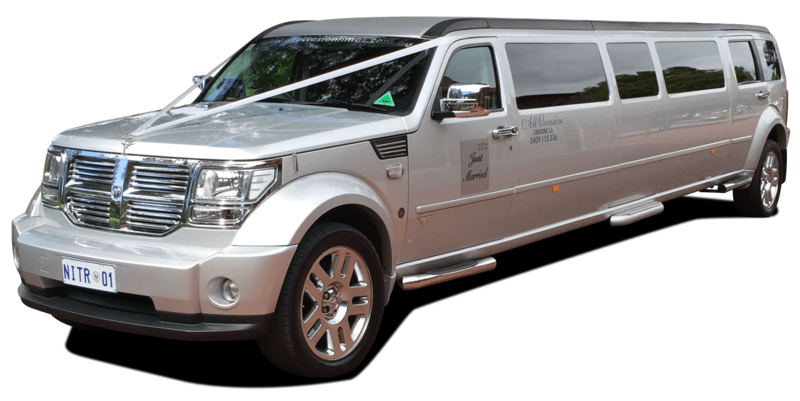 We offer for hire the elegant Dodge Nitro Limousine, the ideal formal car for special occasions in Adelaide which need a little less bling and a more sophistication. This is a swish luxury limousine with beautifully upholstered leather seating and interior finishes. The exterior will make a bold statement which will impress. Choose your own tour through either the Barossa Valley, McLaren Vale or Adelaide Hills wine districts. Sit back and enjoy the drive and surrounding scenery, visiting some well-known, and some not so well known wineries and eateries. Customise your tour to suit your own requirements, or allow All Occasion Limousines SA to organise the itinerary for you. Start the party in style cruising to the city nightlife in one of our incredible limousines. With a light up floor and ceiling, high end sound system, complimentary drinks, the party will well and truly start once in the limousine. Cruise for an hour, or the whole evening. Start at a restaurant, cruise from bar to bar, All Occasion Limousines SA can be there for you, transporting you from venue to venue in safety and style. Be the envy of others as you arrive in one of our state of the art limousines. Hiring a Hummer? – be really really noticed with Adelaide’s only Dodge Nitro stretched limousines. More luxurious than the Hummers hired in Adelaide and more exclusive, a ride in a Dodge Nitro blasts you into a higher plane. Elaborate Interior, vertical lifting gull wing door (on the 12 passenger limo), smoother ride all feature in this hummer hire alternative. 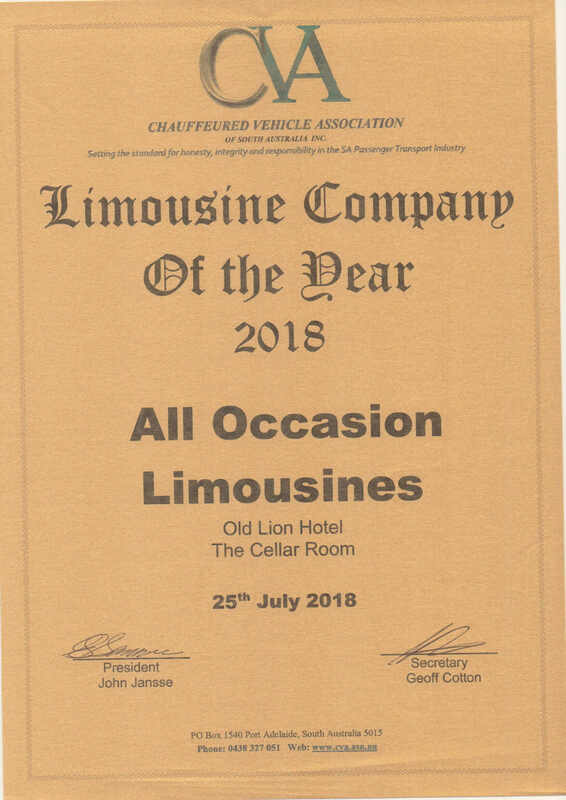 All Occasion Limousines are a proud member of the Chauffeured Vehicle Association and are the proud winners of the 2015 and 2018 limousine company of the year award. Contact us using the information below. To enquire about booking a limo, use our simple online enquiry form. Join us online for all our latest news, special offers, and vehicle updates.